For support (FAQ and Downloads) check the PIP7-1/2 support page. PIP7 - Pentium III and no Fan! The PIP7 is a highly integrated and robust Packaged Industrial PC with the low power Pentium III 400MHz processor out of Intel's Embedded Program. 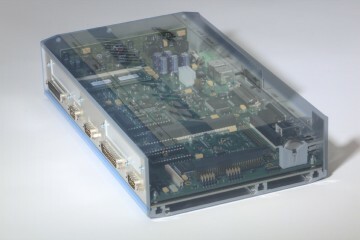 The PIP7 complements the existing PIP Product family (PowerPC and x86) that represents a unique solution for today's demanding industrial needs. PIPs are available in various options and are built into a extreme compact EMI/RFI sealed aluminum chassis. They can be operated under extreme as well as under normal conditions without the need of fans. is the extreme low power consumption of less than 15 W. The solution includes a complete set of PC/AT features as well as special industrial capabilities like 4 serial ports, USB, CAN, LAN a 8-28 VDC Power Supply, ZV port and more. Those features make the PIP7 to ideal the solution for any application where a high power architecture with a low power consumption is required. But high quality, very rugged, small size, universal expandable Industrial PC solution is a need as well. The product can be used in application like the medicine, transportation systems, hand held devices, telecom or any other industrial application just to mention a few.